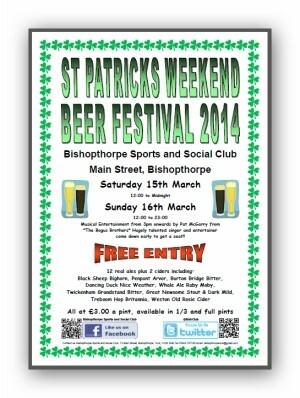 Bishopthorpe Sports and Social Club will be holding its 3rd Annual St Patricks Day Beer Festival on the weekend of March 15th and 16th. There will be 2 ciders and 12 real ales to try, all at £3 a pint, or try tasting the lot with 1/3rd pint tasters for just a pound. Brewers taking part include Whale Ale Co (Warwickshire), Twickenham Brewery (Surrey), Dancing Duck (Derby), Penpont Brewery (Cornwall), Burton Bridge Brewery (Staffordshire), Castle Rock Brewery (Nottingham), Clarks (Wakefield), Great Newsome (Hull) and more locally Black Sheep and Treboom who will be brewing a one-off special beer. The Festival starts at 12 noon on the Saturday until midnight, with all the days sporting action on the TVs and big screen. The Club is proud to announce that for the second year running it has won the CAMRA York branch Club of the Year, and representatives from CAMRA will be making a presentation on the Saturday afternoon. Sunday once again starts at midday, with musical entertainment from 3pm by Pat McGarry of Bogus Brothers fame. Get down early for a seat to see this popular performer. Follow us on twitter @BishClub or like us on Facebook – Bishopthorpe Sports and Social Club.